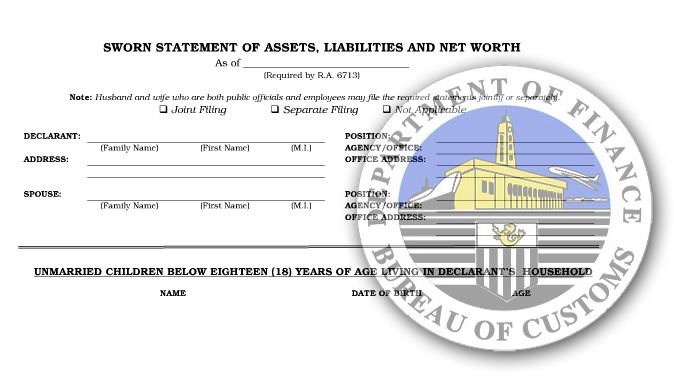 Failure to declare firearms in one’s Statement of Assets, Liabilities and Net Worth (SALN) may be fatal to a government employee. Exhibiting a no-nonsense stand, the Office of the Ombudsman meted on Recaflor Edward F. De Leon (De Leon) a penalty of suspension for six (6) months without pay for his failure to declare in his 2003 to 2011 SALNs his three (3) licensed firearms. Although De Leon insisted that he declared the said firearms under the category of item “others,” the Ombudsman agreed with complainant Department of Finance-Revenue Integrity Protection Service (DOF-RIPS) that respondent De Leon should have itemized what constituted as his other personal properties, pursuant to the instructions in his 2008 SALN. According to the said instruction, when the value or acquisition cost for items falling under the category “others” exceeds Php100,000.00, the same should be itemized. The Anti-Graft Body pointed out that a closer examination of De Leon’s SALNs from 2003 to 2011 would reveal that item “others”mostly pertain to books, computer, personal effects and clothes – not to firearms. Furthermore, the Ombudsman also noted that if respondent included the value of his firearms to the amount found under item “others,” he should have declared a higher amount. Aside from his failure to properly declare the value of his licensed firearms, De Leon also admitted failing to secure the necessary travel authority for his trip to Bangkok in year 2001. Despite De Leon’s justification that he filed his official leave of absence, the Office of the Ombudsman maintained that he violated Executive Order No. 6 (including all other administrative orders) and Section 46 (F) (3) of Rule 10 of the Revised Rules on Administrative Cases in the Civil Service (RRACS) for violation of Reasonable Office Rules and Regulations, when he did not secure the required travel authority. Taking all the above circumstances, the Ombudsman found sufficient evidence establishing De Leon’s guilt of Simple Neglect of Duty. However, the Ombudsman exonerated the respondent for declaring in his 2003 to 2011 SALNs two farm lots in Zambales, which according to complainant were not owned by De Leon. DOF-RIPS calls on the public to report graft and corrupt practices committed by DOF employees and its attached agencies (the Bureau of Internal Revenue, the Bureau of Customs, the Bureau of Local Government Finance, Bureau of Treasury, Central Board of Assessment Appeals, the Insurance Commission, the National Tax Research Center, the Fiscal Incentives Review Board, and the Privatization and Management Office).